You know it. I know it. Everyone knows it. Thanksgiving is stressful for hosts! Yes, it may be hands down the best holiday of the year for the sheer fact that you can stuff your stomach full of delicious food until you pass out, but the time it takes to plan, prep, cook and serve the week following up to the holiday can result in some minor panic attacks and a few empty bottles of wine. Most of us have even been in this boat without a holiday to blame! 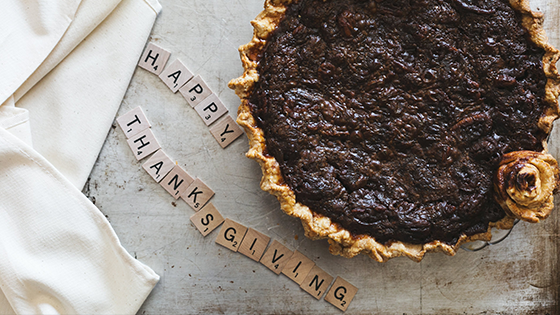 To keep the stress at bay, we’ve gathered the top Thanksgiving hacks we could find! Hosts deserve to relax at some point too, right?! This hack is one of the most widely-known to get a shiny, clean potato. Simplify your prep work by running a bag or two through the dishwasher. It gives you more counter space for prep work while the washer gets a warm-up for a day of cleaning. Also, you don’t have to stop at potatoes either, you can also use your dishwasher as a cooking tool. According to the Huffington Post, you can cook bagels, salmon and lasagna florentine in it! Skin your potatoes with cold water. Boil the potatoes with the skin still on and while they’re still hot, immerse those delicious morsels into a bowl ice cold water. This way, the skins will pop right off! This will have you chopping and crockpot-filling quicker. Store more with a cooler. Breakout the tailgate coolers and put them to work by using them as extra storage. This way you don’t have to throw away items in the refrigerator or leave them out to spoil while cooking your Thanksgiving feast! Simple and cute to use as last minute Thanksgiving decor, but not as great if bugs were sprawled on the table runner. Be sure the bugs are gone by baking the pinecones at 200 degrees for 45 minutes. Keep your wine chilled in style. With a pumpkin wine cooler! Real or fake, just carve a quarter off the top, take out the filling, replace with ice and put in the goods. Decor compliments guaranteed! Muffin tins are your new best friends. This works well for those less popular side dishes! If its bakeable, then make those sides a single serving. That way you don’t have leftovers that you’d rather not eat. Also, wouldn’t stuffing be easier to serve as a muffin anyway? Here are some recipes to to help get you started. 1-2 days out from the big feast, dishwash and peel-pop those potatoes, cut the carrots, chop the onions and wash those greens. You won’t regret doing this ahead of time! By getting these items done, you’ll be able to spend more time watching the Macy’s Day Parade! Last but not least… A dessert hack. Weigh down those pie tins with rice or pennies then pop them into the freezer for 20 minutes to set! That way, all you have to do is fill, seal and bake. Happy Thanksgiving, everyone! We hope you use these hacks to help you survive this most beloved holiday feast. Have you used any of these hacks before? Tell us about it! Until then, cheers! There’s gonna be beer? I am so there….